I’m so sorry for the long absence, my fellow ice-cream lovers! While work distracted me from the blog this summer, it actually accommodated a fun ice cream experience this week! I spent Monday through Friday in Baltimore, Maryland for a team retreat, which was held in a hotel conference room downtown. While most of our days were highly structured, we had a couple free evenings. On Thursday evening, I was mentally exhausted and still feeling full from catered hotel lunches and lots of snacks. In lieu of going out to a restaurant for dinner, I decided to enjoy the warm October night and take a walk to find some ice cream. One of my favorite co-workers, who lives in Baltimore, is well aware of my ice-cream obsession and has been urging me to visit The Charmery for a long time. She insisted it was the best ice cream she has found in Baltimore, so I knew it would be a shame to leave the city without a visit. The Charmery is located in a cool residential neighborhood called Hampden, which reminded me of Seattle’s Capital Hill area. I walked over two miles to get there and planned to take an UberX back to our downtown hotel. Needless to say, the long walk helped build up my appetite for an ice-cream dinner. 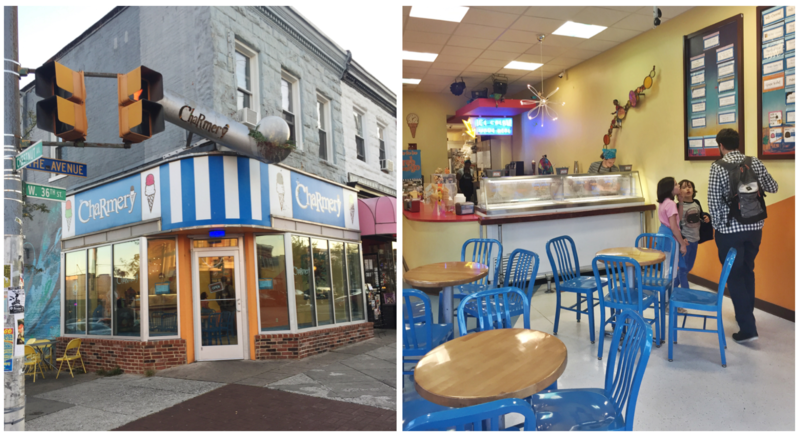 The Charmery is very inviting, with its giant ice-cream scoop sculpture above the door and its bright blue decor. It was not very busy at 6:30pm on a Thursday, but I would imagine that the shop gets quite busy on weekend afternoons and evenings. But I enjoyed the lack of crowds and took my sweet time perusing the flavors menu and trying a few samples. 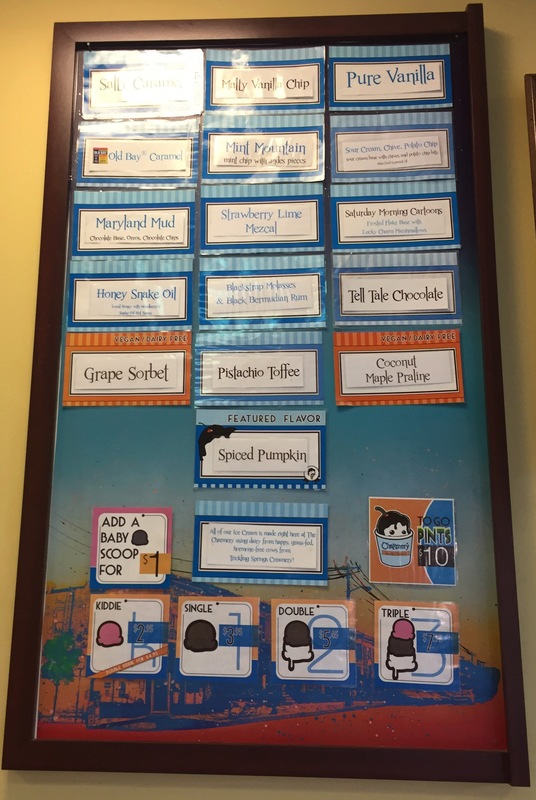 There were 16 flavors posted on the menu, some of which appeared to be permanent (such as Salty Caramel, Malty Vanilla Chip, and the Maryland Mud flavor that my coworker raved about) and some rotating or seasonal options. I appreciated the nice mix of kid-friendly and more adult flavors, as many ice-cream shops seem to cater to one audience over the other. Some of the flavors that caught my eye included: Sunday Morning Cartoons (vanilla base with Frosted Flakes and Lucky Charms mixed in), Sour Cream Chive and Potato Chip (sour cream ice cream with chives and chips mixed in) and Old Bay Caramel. As you likely know, Old Bay is a classic seafood seasoning blend made in Maryland. While I adore Old Bay seasoning on crab, fries, and chips, I couldn’t imagine it going well with caramel. The nice gentleman behind the counter offered me a sample of it, and I have to say that it wasn’t as bad as I expected! When the ice cream first hit my tongue, it tasted like complex, spicy caramel. But the aftertaste was all Old Bay, which kind of grossed me out. Needless to say, I went with slightly more traditional flavors: a double scoop cone of Coconut Maple Praline (a vegan flavor made with coconut milk) and Pistachio Toffee. The scoop set me back around $5.50, which seemed reasonable. The verdict? This cone was just what I needed at the end of a long work trip. The Creamery clearly knows its stuff, and both flavors were well balanced and delicious. My favorite of the two flavors was the Pistachio Toffee, which had a light and natural pistachio flavor with just a hint of buttery toffee. It lacked the traditional chunks of pistachio nuts, but I didn’t mind. The Coconut Maple Praline was nice but was a bit icy, and the coconut flavor overwhelmed the maple and praline. Still, it was very tasty for a vegan ice cream! I enjoyed my cone while meandering down West 36th Street in Hampden, window shopping and people watching in the warm evening sun. I used to think that going out for ice cream had to be a social experience. After all, those childhood memories of sharing dripping cones on family vacations are a major reason why I love ice cream to begin with. So, for most of my life, I wouldn’t have dreamed going out for an ice cream alone. While I’ll almost always prefer to share ice cream with friends or family, I’ve recently begun to experiment with going out by myself. There was a time (not too long ago) when I wasn’t comfortable being alone, so I’ve been on a quest to learn to be my own best companion. After all, the only person I am with 24/7 is me! Last time I flew to Seattle for the weekend, I beat K to the city by several hours (he was working down in San Francisco). My body clock thought it was 11pm, but it was still early local time and very light. I love the long days of early summer in Seattle! Rather than curl up on our hotel bed, I decided to attend to my grumbling tummy and venture out to visit a new ice cream spot in Capitol Hill that my father-in-law had tipped me off to. Frankie & Jo’s is only six months old but is already making a big splash online and in social media. 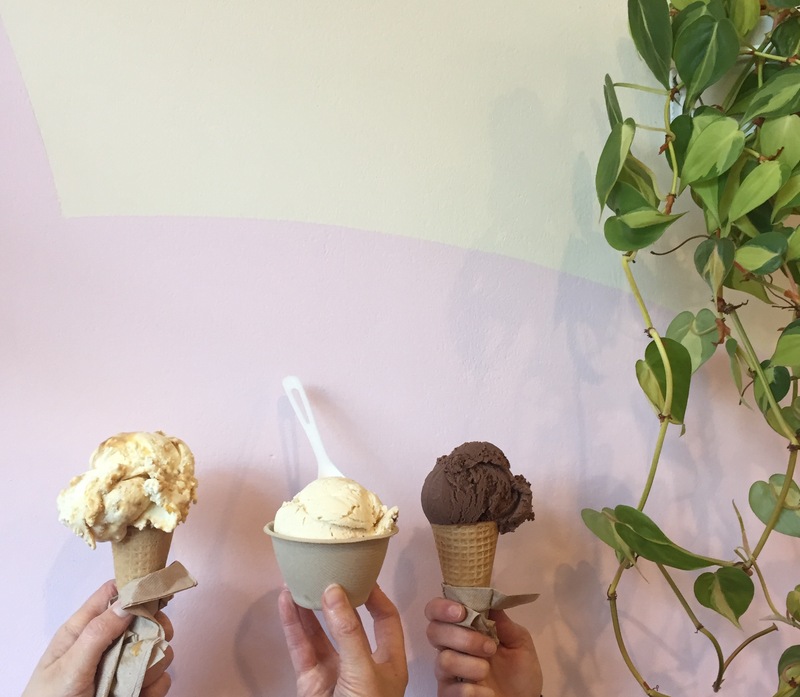 It is the first entirely-vegan and gluten free “plant-based” ice cream spot in town. Like my beloved FoMu in Boston, most of the ice creams at Frankie & Jo’s are made with coconut milk instead of dairy. I’m not vegan by any means, but I really enjoy coconut-milk ice cream. After a long walk in the warm evening sun, I was happy to spot the cheerful bright orange sign outside of Frankie & Jo’s. 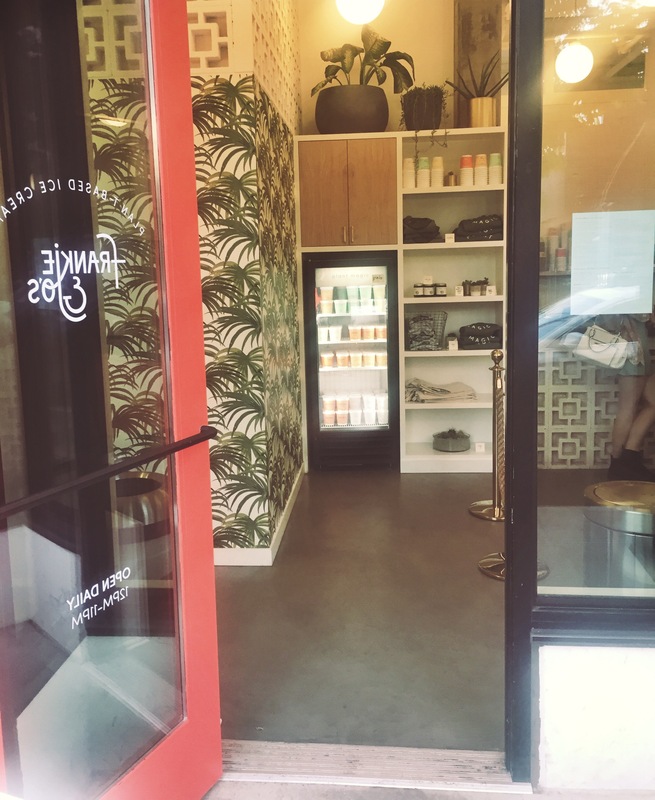 The shop is on the small side, and the interior is uber-hip, with bold green palm trees on the wall, real potted plants, and slate walls. Flavors, toppings, and prices are posted on a giant mirror hanging on the wall. It looked fantastic in person but did not make for good pictures! There were a dozen flavors on the board, including one sorbet and three rotating seasonal flavors. None of the flavors are what I’d call “traditional.” I recognized the Salty Caramel Ash and Gingered Golden Milk from social media. The sorbet, Beet Strawberry Rose, also sounded fun. I was in the mood for something hearty, so the richer-sounding flavors caught my eye: Chocolate Mint Brownie, California Cabin (smoked vanilla and fir needle ice cream with black pepper cardamom shortbread), Mexico Morning (coffee ice cream with almond shortbread and dulce de leche), and Tahini Chocolate. I ended up ordering a standard-size scoop of the Tahini Chocolate ice cream in a waffle cone. 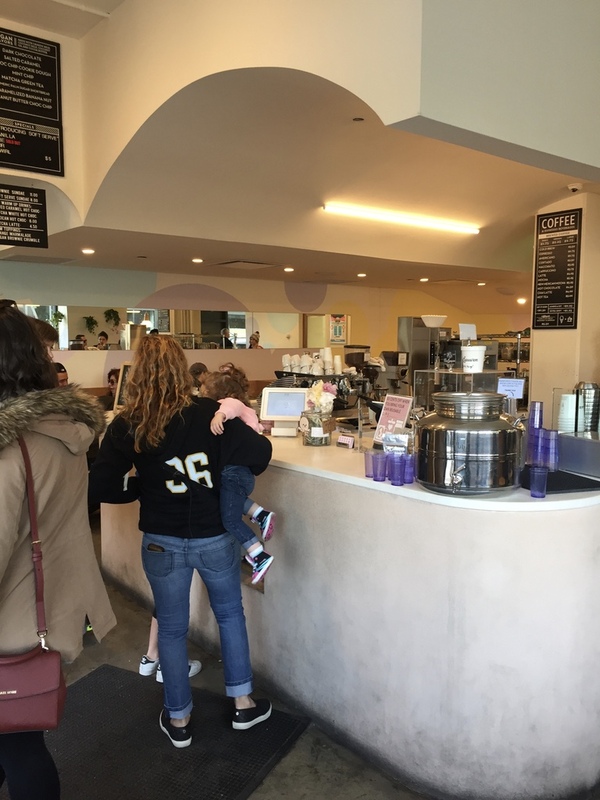 I’d read about Frankie & Jo’s maple-vanilla waffle cones, which are gluten-free and vegan. Since I was a bit hungry, I decided to indulge. The standard size runs $6, and a waffle cone is a $2 upcharge. So, this was a pricey ice-cream cone, but I felt okay about it because of the high-quality and unusual ingredients. The verdict? It took just one bite for me to fall in love with Frankie & Jo’s. The Tahini Chocolate ice cream was sweet, salty, and nutty. Unlike with most coconut-milk ice creams, I couldn’t pick up on the coconut at all. The texture was thick and creamy, with a good bite and a few chewy bits of tahini. I’m guessing that the light brown swirl was chocolate sauce, but I couldn’t detect a chocolate flavor. But all was forgiven because this ice cream was divine. My pleasure was doubled when I got down to the cone; the maple-vanilla waffle cone tasted more like a crispy cookie than a waffle cone. The flavors of maple and brown sugar complemented – and maybe even enhanced – the rich tahini ice cream. 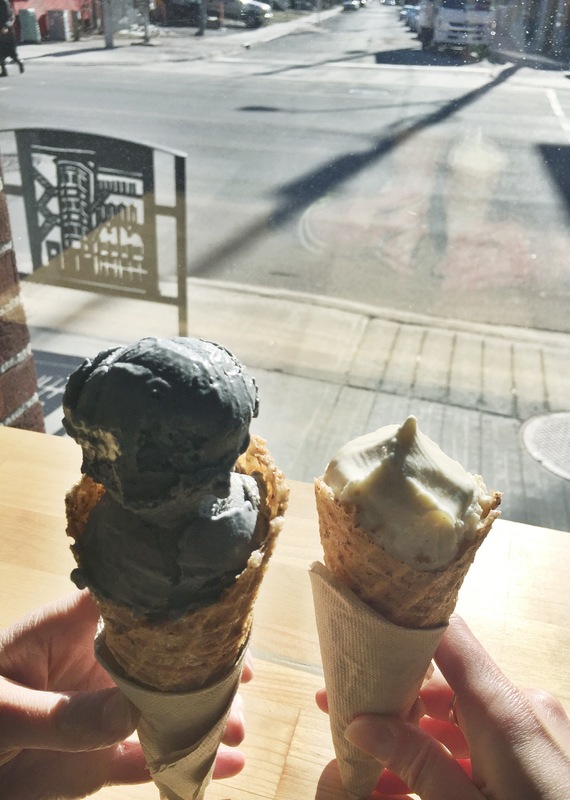 Between Frankie & Jo’s, Glass Bottle Creamery, and Moo Shu Ice Cream, it’s been a good year for gluten-free waffle cones! During the summer before my senior year of college, I interned at a non-profit in the Boston area. Since the nonprofit was small and underfunded, they depended a lot on the help of summer interns. There were about eight of us that summer, and we broke up into smaller teams, researching and writing about specific topics. I was paired with Yael, a smart and passionate young woman from Canada, and it didn’t take long for us to develop a special friendship. When the summer came to a close, Yael headed back to McGill University in Montreal but promised to reach out next time she visited her sister — who conveniently lives in DC! Lucky for me, Yael visits DC fairly often and we’ve been able to grow our friendship over the past 10 years. She’s also my e-mail pen pal; we write each other long and meaningful emails several times per year. I was so glad when K and Yael hit it off the first time they met; the two are very different on many levels, but their friendship has an obvious ease. But thanks to busy schedules and expensive airfare, we haven’t been able to spend nearly enough time together over the years. So K and I were both touched when Yael made the long journey out to Vashon Island for our wedding in 2014. I’m ashamed to say that it took over two years for K and I to return the gesture, and visit Yael in her current home city of Ottawa, Canada. But we finally got our act together and booked a weekend trip last month. 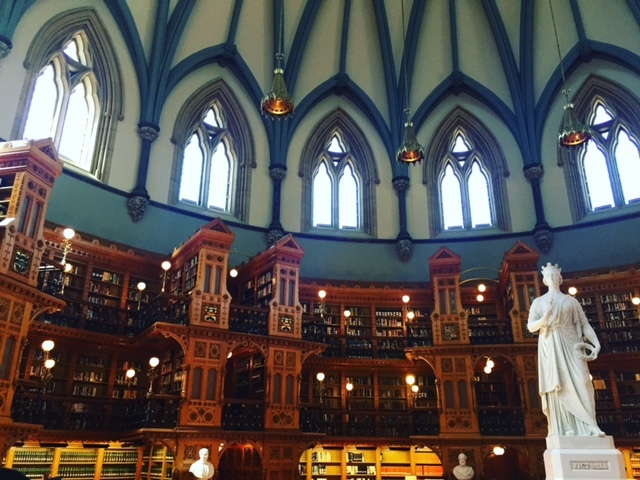 While the two days flew by, Yael gave us a fantastic introduction to Ottawa’s beauty, culture, and food scene. We shared breakfast tacos, took a tour of Parliament, walked through the downtown area, ate at a hip new restaurant, and even watched Yael play in her curling club! Like the good friend she is, Yael offered to bring me to a new ice cream shop in her neighborhood called Moo Shu Ice Cream & Kitchen. She had mentioned it to me in an email a while back, telling me about the black-sesame ice cream and an innovative flavor made by soaking Froot Loops in milk. So, on Saturday afternoon, Yael and I made the 10-minute walk down her street to Moo Shu. It’s a small shop, tucked in a row of cute shops and restaurants in a bustling part of the neighborhood. The friendly-looking cat logo is quite welcoming, and I can imagine this place is packed on warm summer evenings. But, on this cold afternoon, I wasn’t surprised to see just a handful of people inside. Inside, Moo Shu is quite trendy – sparsely decorated, clean lines, white walls, and a couple tall wooden tables. But you’ll notice lots of charming small details, like a collection of small plastic Chinese cats along the wall behind the counter. Its young owner, Liz Mok, spent her childhood in both Hong Kong and Vancouver and brings youthful Chinese flare to both her shop and food. While the focus is on ice cream, Moo Shu also serves wontons and rice during lunch. Warm, sugary smells greeted me when I walked inside, thanks to the homemade cones cooking in the waffle iron behind the counter. The menu is quite short, with just a couple traditional flavors like Local Strawberry and Chocolate (which is vegan). 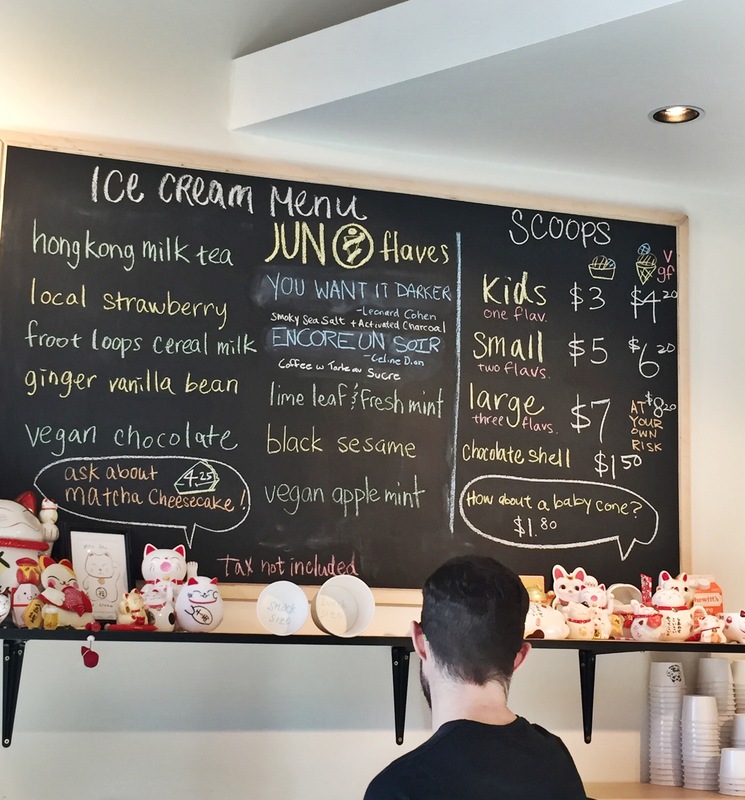 I’d say that most of the flavors are on the unusual side, like Hong Kong Milk Tea, Froot Loops Cereal Milk, Vegan Apple Mint, and Black Sesame. There were two seasonal specials named for singers — “You Want It Darker” for Leonard Cohen (smoky sea salt + activated charcoal) and “Encore Un Soir” for Celine Dion (coffee with tarte au sucre). Like many places in Ottawa, Moo Shu is very accommodating for those of us following gluten-free, dairy-free, and vegan diets. Thus, I’m surprised that Yael had never noticed that Moo Shu’s homemade waffle cones are gluten-free and vegan! We were nearly giddy when I spotted those little GF and V markers. Despite the short menu, I had trouble selecting flavors. Black Sesame was a must, since – when done well – it’s one of my favorite favors. Celine Dion’s flavor sounded divine, but I decided to steer clear of the wheat in the pastry (which I can be sensitive to). In the end, I went with a small cone of Black Sesame and “You Want It Darker.” I wanted to know what this whole charcoal trend is about. Yael ordered a kid-sized cone of Ginger Vanilla Bean. The prices were reasonable, with my cone setting me back about Can$6.20 (including the $1.20 surcharge for a cone). The verdict? Moo Shu may seem trendy, but their top-quality ice cream tastes timeless. Both scoops were my perfect consistency; frozen hard enough to be able to bite into, but creamy enough to melt quickly on your tongue. The “You Want It Darker” wasn’t my favorite; I liked the saltiness, but the activated charcoal tasted like sweet ash. Maybe it’s an acquired taste? The Black Sesame was nutty and toasty, with a bright and sweet aftertaste. It’s beautiful dark gray color made the ice cream seem oh-so-sophisticated. But the real star of my cone was the cone itself! Crunchy, light, and sweet, this cone was unlike anything I’ve ever eaten before. Enjoying good ice cream with a good friend… does life get any better? Don’t you love when, sometimes, what you desire magically comes to you without any effort? You might receive a call from a long-lost friend you’ve been meaning to reach out to, or get a big discount on something you’d expected to pay full price for. Every once in a while, the stars perfectly align and you can’t believe your luck. I had one of these moments on a trip last month, when K and I joined our friends Becca and Bryan for a weekend in Mexico City. A mere four-hour flight from Washington, DC, Mexico City seems like a world away. The four of us squeezed a lot into 36 hours (we left early on Sunday), eating plenty of street food, taking a long walk through Chapultepec Park, exploring one of the city’s largest markets, and enjoying a fancy meal at Pujol (quite possibly my favorite restaurant in the world). The only disappointment of the weekend was when we took an Uber over to Frida Kahlo’s house on Saturday afternoon, only to find that they had temporarily stopped letting visitors inside due to a power outage in the neighborhood. The line was getting quite long, so we bailed in favor of taking a stroll through the beautiful neighborhood of Condesa. Since we had so little time to spend with our friends in Mexico City, I wasn’t planning on going out of my way to find a new ice cream shop. But, alas, the stars were about to align for me (and the blog! ): our Uber driver dropped us off in the middle of the Condesa neighborhood. Without a specific plan, we began meandering down the pretty tree-lined streets. We couldn’t have walked more than two blocks when we came upon a true Mexico City ice-cream establishment: Nevería Roxy. Nevería Roxy is a small family-run ice cream chain, with four locations around Mexico City. The first shop opened over 70 years ago, and the shops are known for their nostalgic 1950s vibe. When we just happened to stumble upon the Condesa shop, I took it as “a sign” that we had to take an ouce-cream break! Nevería Roxy was crowded on a Saturday afternoon, with a long line to get to the counter and plenty of people sitting around the formica tables enjoying ice-cream floats, cones, and sundaes. Like their decor, Nevería Roxy sticks with good-old fashioned ice cream flavors. With a couple dozen flavors of ice cream (“helado”) and sorbet (“nieve”), there is something for everyone. Some of the ice cream flavors that caught my eye were Arroz con Leche, Tutti Frutti, Amaretto, Macademia, Menta (mint), and Mamey (a local tropical fruit). But several of the sorbet options — Sandia (watermelon), Tamarindo, and Maracuya (passion fruit) — sounded enticing. But when I saw Cajeta, I knew there was no turning back. 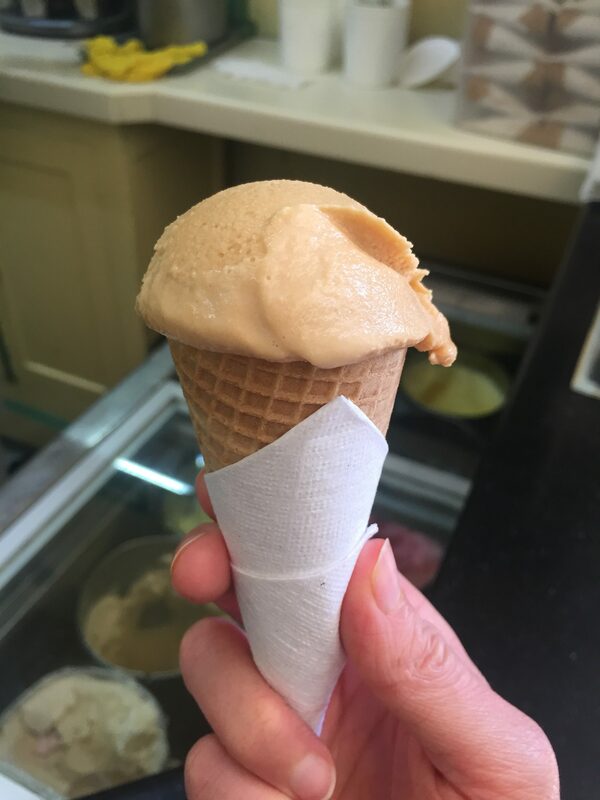 Cajeta is a traditional Mexican caramel made with goat’s milk, and it reminded me of one of my favorite ice creams of 2015: the Greedy Goat’s salted caramel goat ice cream. Since we had big dinner plans that evening, I stuck with a small cone (called “bola chica”). While the serving size was small, this cone set me back a mere 22 pesos, or USD$1.25. It would be difficult to find a better deal than that! The verdict? I had high expectations for this ice cream, and Nevería Roxy delivered! The ice cream itself was smooth, dense, and creamy. It was slightly too soft, thanks to the hot day and no air conditioning. But the Cajeta flavor more than compensated; it had a deep, carmelized flavor with just the tiniest tang from the goat’s milk. I found myself wishing the scoop was larger, because I finished this cone in about 2 minutes flat (despite savoring and “mmm”ing the whole time). I’m so glad that we stumbled upon this Mexico City institution! Last month, K and I stuck to tradition and headed down to Rio de Janeiro for a long weekend of sunshine and beach time. This was a special year, however, since my little sister Carolyn and her boyfriend joined us. The two of them spent a full week in Brazil, spending several days in Búzios before driving to Rio to meet up with us. This was a special occasion – the first-time Carolyn and I have been together outside of the United States! While our trip only lasted three days, we packed in a whole lot of fun! 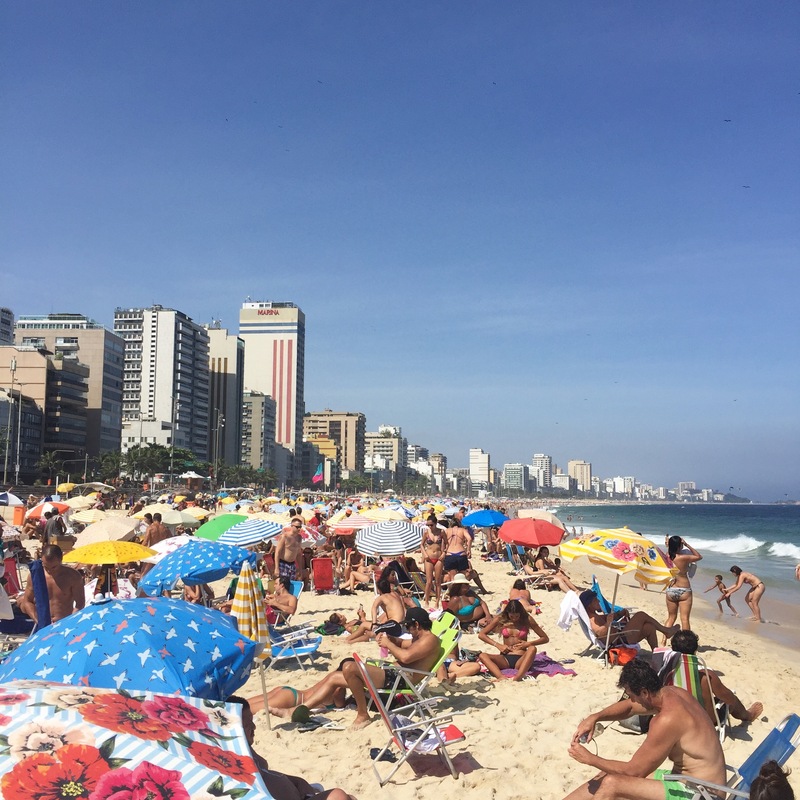 Since the weather was fantastic, we spent many hours lying in beach chairs on Copacabana Beach, enjoying the array of snacks carried by the many beach vendors and sipping coconut water and caipirinhas. Carolyn and I share a love of swimming, and it felt very special to splash around in the waves together like little kids. Vacation heaven. We also discovered some new places and activities with Carolyn and her boyfriend. Thanks to Carolyn’s cravings for nutritious lunches, we discovered the deliciously hip, gluten-free fast food shop Jaeé (shout-out Fred, the owner, who was very hospitable). And on Saturday, the four of us rented bicycles from the Sheraton and rode along the beach all the way to Leme and back. Rio is known for being one of the best cities in the world for biking, so I’m not sure why K and I waited so long to try it! 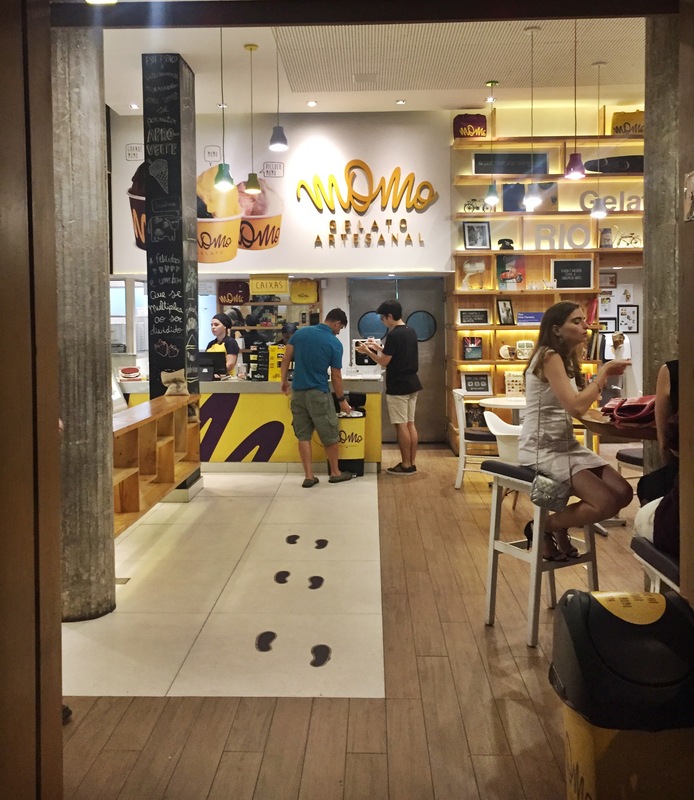 Momo Gelato Artesanal is a well-known gelato shop in Rio de Janeiro, churning out Italian-style gelatos and sorbettos in dozens of flavors. They have two locations, but the Leblon one seems to be the original. Momo was very busy on this Saturday evening, with its storefront open to the street and people milling around with cones and cups of delicious-looking ice cream. Momo also offers sweet waffle sundaes. Not waffle cones, but actual waffles! I thought Momo’s yellow and brown color scheme was surprisingly attractive. Like any uber-popular artisan ice cream shop, Momo sells a variety of shirts, hats, bags and other branded paraphernalia. But the focus of the store is clearly on the long cases of gelato pans. I counted at least two dozen different flavors, including nearly 10 sorbetto flavors. 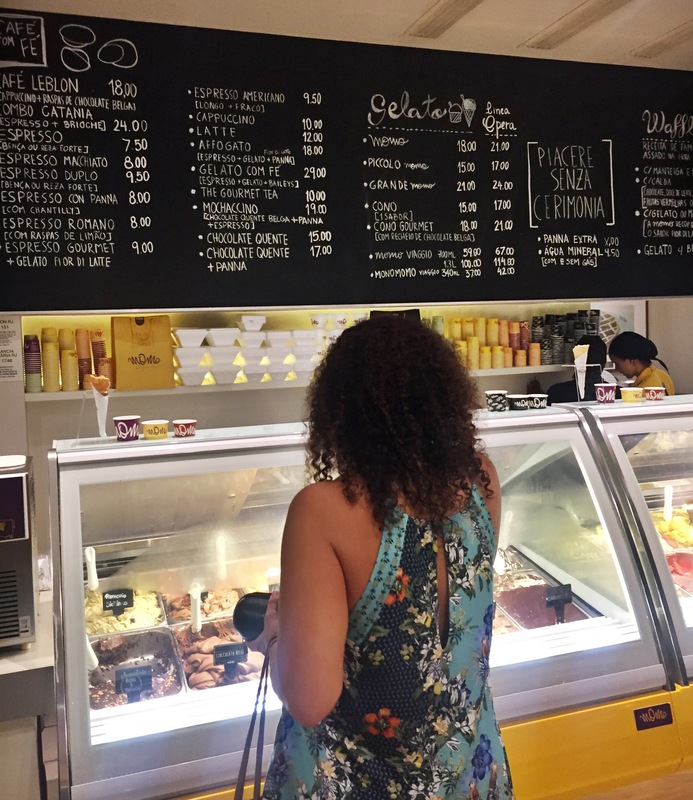 The flavors were posted in Portuguese, but a major advantage of gelaterias is that the gelatos are often are covered in toppings or decorations that identify the flavors. For example, you’ll see hazelnuts and chocolate over Gianduia, crushed pistachio nuts over Pistacchio Siciliano, and coffee beans over Cappuccino. While Momo serves these usual Italian staples among others (like Stracciatella, Pear, and Limoncello), the local flavors that jumped out to me were Caramelo com Flor de Sal (salted caramel), Banana com Canela (banana with cinnamon), and Pão com Nutella (bread with Nutella). Momo’s serving sizes didn’t look very large, so I decided to order a three-scoop cup. I was immediately drawn to a black-looking chocolate, Neromomo, which the signage noted was 73% cocoa. The color was just so dark and interesting that I had to give it a shot! To cut the chocolate, I also ordered a scoop of simple Cremomo (sweet cream). And in the spirit of “When in Rome Rio,” I rounded out my cup with a Amazônia (açai + tapioca). I call this “Grace’s antioxidant special.” This cup set me back around R $15.00, or around five U.S. dollars, which is quite expensive for Rio! The verdict? I may have finally met my chocolate limit! The Neromomo, Momo’s dark chocolate gelato was incredibly rich and powerful, and not very sweet. I can’t remember ever having a chocolate ice cream quite this dark. While I enjoyed it, this flavor was a bit much for me. It was a good thing that the sweet, milky Cremomo helped cut the overwhelming dark chocolate taste. Sadly, the Amazônia wasn’t as yummy as the açai bowls we had on the beach. The gelato was a bit icy and the flavor of açai wasn’t very pronounced, but I did like the little bits of granola! 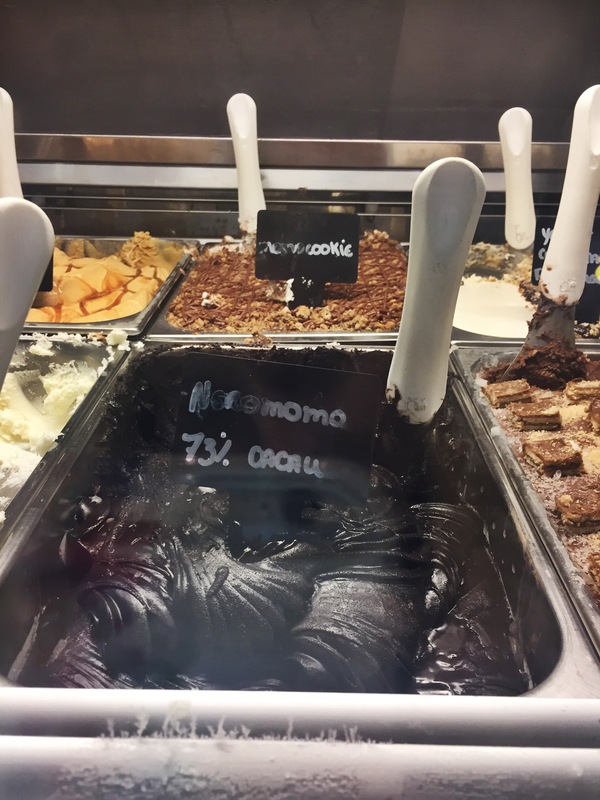 While I wasn’t “wowed” by these three flavors, I enjoyed the ambiance of Momo Gelato and would happily give it another try! Two weeks ago, my two sisters and I met up in New York City for a 30-hour sisterly adventure. We did this last year and enjoyed ourselves so much that we simply had to do it again! The Big Apple is a good central meeting place for the three of us, coming from DC, Boston, and Connecticut. K was kind enough to find us a room at the Hyatt hotel near Times Square, and we used that as a home base. We packed in a lot of fun between Saturday lunchtime and Sunday evening: shopping at Rituals and Eataly, dinner at the veggie-forward Dirty Candy, petting dogs at Madison Square Park, and a yoga class at MangOh. I find that spending “special time” with my sisters, especially overnight, is very therapeutic. On Saturday afternoon, the three of us jumped in an Uber to head to Brooklyn for a bite of lunch and to visit my dear girlfriend Elysia and some of her friends at a going-away party. While we only spent a couple hours in Brooklyn, my sisters and I agreed that it was VERY hip and eccentric. Luckily, we happened to walk by one of Brooklyn’s hottest joints: Van Leeuwen Artisan Ice Cream‘s Williamsburg location. While I can’t remembering hearing anything about the company, Ava first learned about Van Leeuwen’s ice cream when the company catered one of her friend’s dog’s birthday party (I can’t wrap my head around that). She told us that they were known for innovative vegan flavors, and we were sold! Van Leeuwen started as an artisan ice-cream truck in 2008, serving ice cream across the city. They built up quite a fan base and now have eight (8!) locations, scattered across the NYC area and Los Angeles. But, staying true their roots, Van Leeuwen still operates several ice-cream trucks seasonally and for private events. The store was fairly busy for a late winter afternoon, with families and groups of friends sharing cones and cups of ice cream. The shop itself was a mix of modern and old-fashioned, with plenty of seating for guests. My only disappointment was that you can’t see the ice creams… they are hidden behind the counter in big metal tubs. Van Leeuwen’s menu looks clean and simple, but there are MANY flavors to choose from. There are about a dozen “classic” ice cream flavors that are staples on the menu, along with 8 vegan versions and a selection of “special” flavors. Some of the “classic” flavors are quite traditional like Vanilla, Chocolate, Mint Chip, and Cookies + Cream, but several are unique, like Earl Grey Tea, Passionfruit Layer Cake, and Honeycomb. 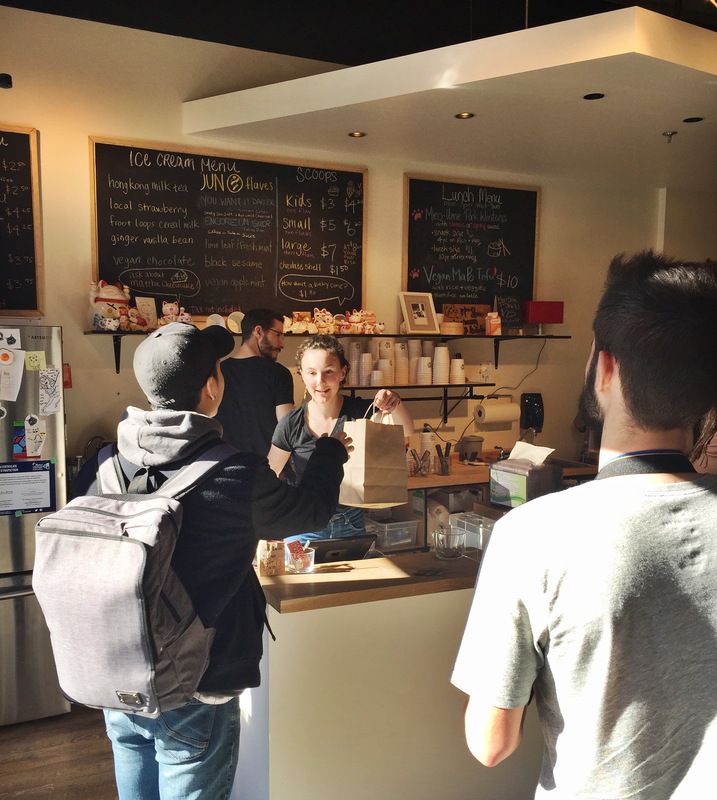 The vegan offerings include Salted Chocolate, Matcha Green Tea, and Caramelized Banana Nut. And the “specials”? They were special indeed: Pumpkin Pie, Salted Caramel Rocky Road, Sour Cream Apple Cider Doughnut, and more. The verdict? 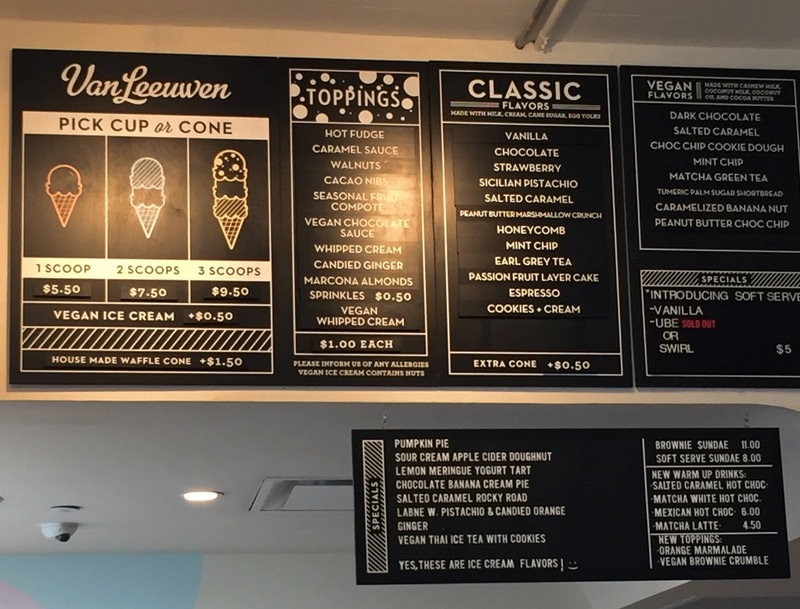 Overall, we were impressed with Van Leeuwen’s ice cream! The Honeycomb was the color of caramel, with thick swirls of softened, chewy honeycomb. The sweet-cream ice cream base was rich and milky, and served at the perfect temperature (cold but not rock-hard). Carolyn’s Vegan Dark Chocolate scoop was a chocolate-lover’s dream, with an intense cocoa taste that masked that ubiquitous flavor of coconut milk. You could have thought it was full-dairy ice cream! While Ava enjoyed her Peanut Butter Marshmallow Crunch, she thought it was a tad too icy and could have used some more marshmallow to counter-act the rich peanut-butter flavor. We all agreed that the serving sizes were perfect — just big enough to be satisfying but not spoil your dinner! I can’t wait to return to Van Leeuwen to sample some more of their other flavors! My husband loves foie gras. And I mean really loves it. So much so that he insisted we serve it to our guests at our wedding. Me? Not so much. Foie gras is rich, fatty and melts in your mouth. It’s a unique flavor that people tend to love or hate. If you’re a fan of foie, do I have an ice cream recipe for you! On a recent cold Sunday, K and I found ourselves with no plans. I haven’t made homemade ice cream in a while, so I started getting ready to go grocery shopping to pick up some supplies. But what flavor should I make? K was feeling creative. “How about foie gras ice cream?” he asked. We had tried foie gras ice cream in Hong Kong once, and K wanted me to try it at home. Not one to back down from a cooking challenge, I hit up Google for some inspiration. K always keeps a big supply of foie gras in our freezer, which he buys directly from Hudson Valley Foie Gras. When you see foie gras on the menu at any of the top restaurants in the U.S., there is a good chance it comes from Hudson Valley. Foie gras itself can be controversial, but Hudson Valley is committed to careful and transparent processes. You can even schedule a visit to their farm in Upstate New York — and take photos! Foie gras is often served with fruit, or fruit preserves, so that got me thinking about peanut butter and jelly. There are many great recipes for peanut butter ice cream out there, so I used some for inspiration and took plenty of creative license! This recipe is egg-less, but it still isn’t the easiest of recipes. First, you heat the milk and cream with the sugar until it’s dissolved. You cook the foie gras, then use a blender to blend it completely with the ice cream base. Once the ice cream is ready, you layer it with swirls of jam. I would recommend high-quality jam here. Homemade would be ideal! While I love dear old Smuckers, I just don’t think gelatinous jelly would do well here. In a medium saucepan, combine the cream, milk, and sugar. Bring the mixture to a simmer over medium heat, and cook until sugar dissolves. Remove from heat and mix in the peanut butter, vanilla, and salt. Chill the mixture in the fridge for 1 hour or until cool. Meanwhile, cook the foie gras. You could grill it, but I had K sear it on the stove and finish in the oven. Pour the ice cream mixture and foie gras into a blender and blend until completely smooth and frothy. Pour mixture into ice cream maker and freeze per the manufacturer’s directions. If you’re using a Cuisinart, this means 1) turn on your machine, 2) slowly pour mixture in, and 3) leave the thing alone for 15 minutes or so. In an airtight container, layer the ice cream with thin layers or drizzles of jam. When you’re done, you can take a wooden skewer or think knife and make a couple swirls. You can find more tips about making swirls (plus photos!) in this article. Freeze for at least an hour before serving. The verdict? This was some rich, fancy ice cream! While the foie gras flavor wasn’t as prominent as I’d expected, it did seem to deepen the taste of the peanut butter. We could taste the foie gras when we thought about it, but we’re not convinced that we could have named the flavor if we didn’t know what it was. The ice cream base wasn’t very sweet, but the jam swirl brought a sugary punch. I’m glad that I sprung for the fancier, expensive mixed berry jam, as it brought another level of sophistication to the dish. Look at that red color! Overall, this ice cream was smooth, thick, and complex. 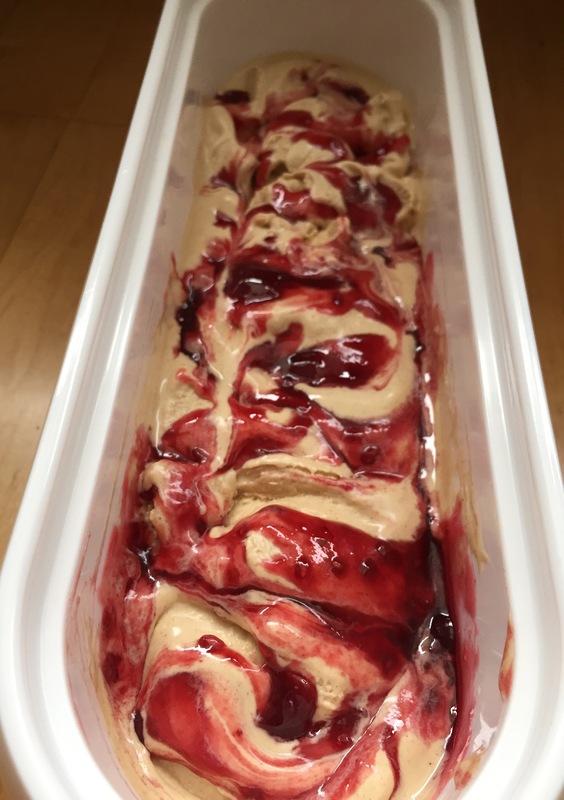 If you have a foie-gras fan in the family, you should make this ice cream for a special occasion!